India is the world’s second-largest producer of tropical fruit and vegetables, but a huge amount of the harvest — up to 40 per cent — is lost to spoilage on the farm, in the warehouse and in transit before it ever reaches the consumer. To reduce the waste, researchers at India’s Tamil Nadu Agricultural University and the University of Guelph in Canada are finding ways to use a natural substance called hexanal to slow ripening, get more fruit to market and improve the lives of farmers. “If we can give farmers a bigger window, it gives more stability to the pricing and more flexibility for packers and shippers,” says Subramanian. The work is jointly funded by IDRC and Global Affairs Canada through the Canadian International Food Security Research Fund. In 2012, Subramanian and K.S. Subramanian (no relation), a biochemist at Tamil Nadu Agricultural University, started testing hexanal on tropical fruits such as mangoes and bananas in India. Some varieties of mango sprayed with hexanal stayed on the trees for an extra three weeks before needing to be picked, and after harvest they lasted three weeks longer in storage than unsprayed fruit. That delay brought big advantages for the farmers. Instead of harvesting at the same time as everyone else when prices are low, they could wait for prices to rise again as the glut cleared. “The longer you can retain the fruit on the trees, the higher the price,” says K.S. Subramanian. Each day that the farmers could hold off on harvesting earned them an extra 1,000 rupees per acre. 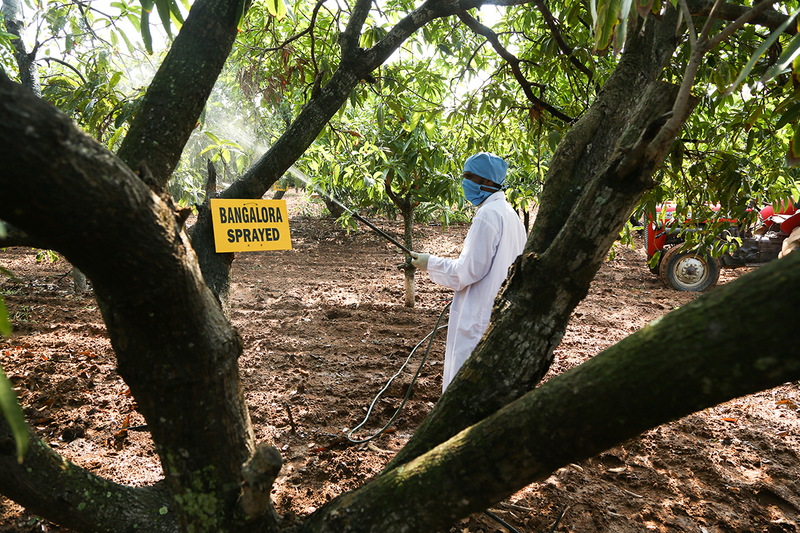 The sprayed fruit was also more firmly attached to the trees, reducing losses to strong wind and rain, and had fewer pests and diseases, reducing the amount of rejected fruit from 50 per cent to less than 10 per cent. Because they retained fruit better, each sprayed tree produced between five kilograms and six kilograms more fruit than the control trees. Bananas proved to be trickier because their thick skins and waxy coatings make field spraying ineffective. But dipping them in hexanal after harvest helped them to stay fresh for several weeks longer than usual. The research involved 4,000 farms across the state of Tamil Nadu, 70 per cent of which were small or marginal farms of less than two hectares. The technology was popular with farmers, with 70 per cent of those involved saying they would like to keep using it in the future, says K.S. Subramanian. The researchers are now working on embedding hexanal into tiny pores in nanoparticles that can be placed in a pouch in a packing box (much like the small desiccant packages found in shoeboxes) or made into a sticker that’s placed on the fruit after harvest and continues to release hexanal during shipping, keeping the fruit fresher for longer. “It can close down the ripening process significantly,” says Jayasankar Subramanian. The spray and dip technology is already starting to be accepted by agricultural regulators in India and Sri Lanka, says K.S. Subramanian, where it will soon be available commercially, with work continuing on the nanoparticles. Jayasankar Subramanian expects it to be approved in North America within 18 months, and in Costa Rica and Guatemala in 2019. The researchers also hope to expand the use of hexanal to Africa. The work could have an impact on health as well. Because so much of the harvest is lost, people in India and Africa are not big consumers of the fruits and vegetables that they produce. Hexanal could help not only improve the economic outlook for farmers but also the diet of local people.